The beginning of the middle age is inevitably a critical point in a person’s life. In the mid-40s is when fat deposits start to build in and muscle mass starts to decrease. That eventually might cause heart issues, obesity, high blood pressure, diabetes, stroke, etc. But you can reduce that. How? By implementing the essential elements of having a healthy life. The key elements of following a healthy lifestyle are following a healthy, balanced diet and exercising on a regular basis. The fact is that the body needs food that contains a nutrient value in order to spend the energy from it. We learned to become more aware of what we eat, count calories, do strength workouts and cardio workouts. But after 40 the energy balance of the body can lower the ability to do exercises as you used before. But even for that, there is a solution. 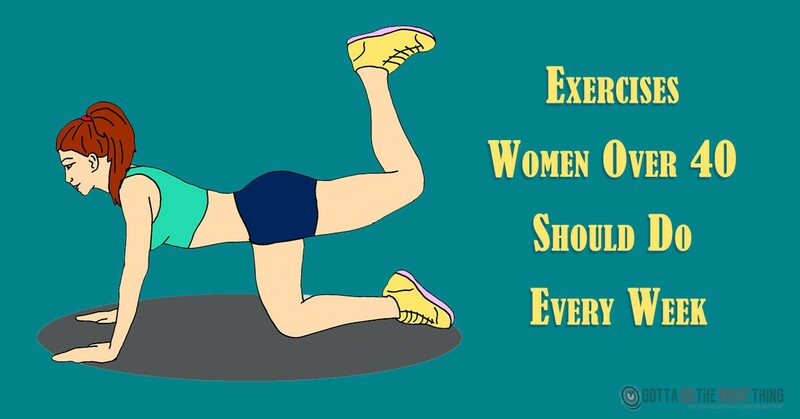 There are 9 exercises which are extremely beneficial for women over 40. Read on to learn how they can help you. Women over 40 should opt to use the elliptical machine in order to do cardio. With that, you will do the necessary cardio, and at the same time, you will be doing some great cardio workouts. Low-impact cardio is a good way for women over 40 to keep their heart healthy. Yoga is good for the body, regardless of the age. But it is especially good after 40 since it helps you fight depression. Yoga tones the body, and helps keep you relaxed and balanced. Remember, when it comes to yoga it is never too late to start. When it comes to planks, you should know that they are amazing to train your strength and stamina. You need to do this exercise 3 times on a weekly basis for 90 seconds. This is a great exercise to tone the core muscles of your body. It can help you strengthen the muscles around your chest, spine and also your abs. The entire midsection can support the lower back. You need to do leg lifts. Just pay close attention to the movements and your posture. Squats is a nice, classic workout which doesn’t require workout equipment or machine. You can do it from the comfort of your own home. It is good for the overall strength and gluts. This exercise can help prevent injury by improving the flexibility and toning your body. In order to do squats properly, you need to keep your knees right above your feet and keep your back straight. It is said that Tai Chi is good for people who are over 40 years old. It helps relax your mind and provides bigger concentration when it comes to the movement of your body. You need to understand that weight lifting doesn’t necessarily need to be intense. In order to maintain your muscle all you need to do is some barbell biceps curls. With strength training, you can protect yourself from chronic joint pain. This type of pain attacks people of all ages, but don’t be discouraged; it is never too late to start with strength training. With the help of lunges, you will keep the muscles in your legs toned. You should know that there are a couple of variations of the lunges that will help you maintain different leg muscles tight and strong. All you need to do is find the one that works for you. Walking might be simple but is highly efficient. This is the best exercise since everyone can do it. There are many health benefits of walking. For example, it helps improve your mood, it tones your body, and it burns calories. The truth is that years don’t mean a thing, stay active, and remember 40 is the new 20. Exercise and enjoy life every day.